President Michael read out a letter from Rev Peter Mascarenhas stating that he would be resigning from the Club at the end of June owing to his increasing workload with the Church. He wished to attend meetings on occasions and continue with some of the youth activities which he has been associated in the past. Andy Hope from Tarporley Rotary gave a ’My Life’ talk involving his exploits as a Dairy Herdsman, which culminated in manufacturing yogurt and cheese. In a small, bustling corner of rural Cheshire lies Tiresford Farm, the home of the widely renowned Tiresford Guernsey Herd and latterly of Tiresford Guernsey Gold Cheshire Yogurt. These beautiful, golden cows have graced the landscape for many years, being one of the first sights for anyone entering the village. Even in such everyday situations such as directing people towards Tarporley or its neighbouring villages, the cows act as one of the most enduring images, a clear, outstanding focal point. This has been the case for the last 55 years when Elizabeth (Betty) Posnett first started registering pedigree Guernsey cattle on the land at Tiresford. Elizabeth was dedicated to the advancement of the breed and this continued for many years, initially though her own endeavours and then subsequently through those of the late John Posnett. John's name became synonymous with the Guernsey breed; he was an international breed judge, chairman of the English Guernsey Cattle Society and president of the society for an unprecedented two terms. John's vision and drive meant that Tiresford became one of the most prominent pedigree Guernsey herds in the world. 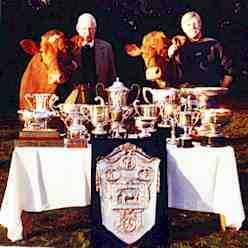 In 1990 John was joined as a partner by Andrew Hope and the herd enjoyed a good deal of success over the next fifteen years winning an unprecedented 7 'Supreme Championships' against the top cattle of other breeds. In 2004 the decision was made to maximise the unique qualities of Guernsey Milk further and Tiresford Guernsey Gold Cheshire Yogurt was born. Following John's death in 2005, Andrew took on the tenancy at Tiresford and has continued developing both the Guernsey herd and the yogurt business. With support from his wife Sue and sons John and Peter, Andrew has maintained the innovative and forward thinking outlook of Elizabeth and John whilst staying true to the traditions and values of the unique Guernsey breed.